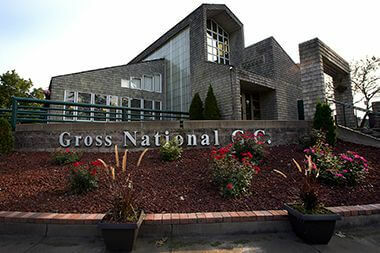 Gross National Golf Club opened in 1925. It has gently rolling hills with elevated tees and greens. We rent riding carts, although many golfers enjoy walking the course. There are three sets of tee-markers on each hole to challenge all skill levels. 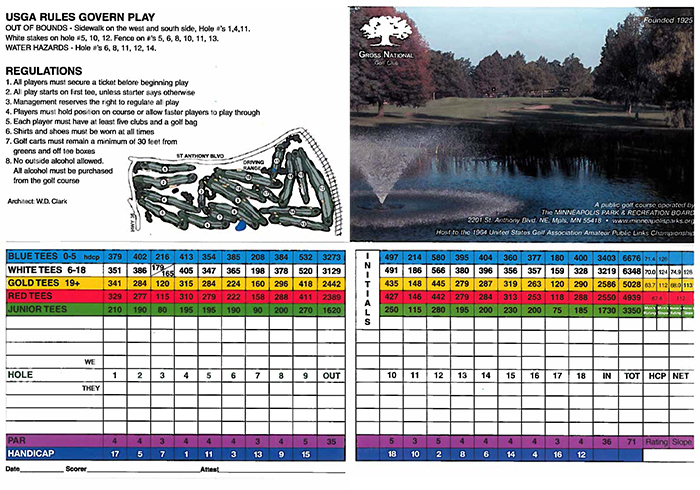 It is a mature course with lots of old trees. It hosted the 1964 USGA National Publinks Championship. 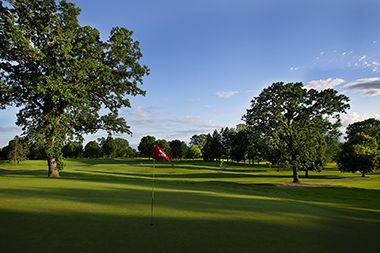 The course’s location makes it readily accessible from Minneapolis or St. Paul with Interstate 35W marking the southern boundary. A great layout is how most customers describe the course; another reason Gross has been considered The People’s Choice for years. Gross National Golf Course is a great place to host your next golf tournament, corporate outing, or family event. Hosting a larger event? 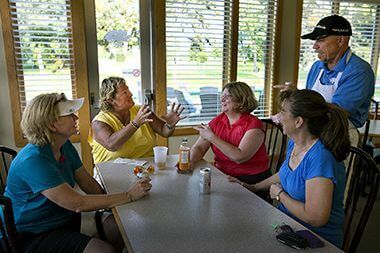 Wirth and Columbia golf courses offer meeting rooms, banquet facilities, and full catering services. Name: The course was named for Francis A. Gross, a park commissioner for 32 years between 1910 and 1949 and president of the park board 1917-1919 and 1936-1948. He was so closely connected to the parks that he earned the nickname “Mr. Park Board.” The park board voted to name the golf course for Gross on November 5, 1947 in what came as a complete surprise to Gross. Until then the course was called the Armour Golf Course after the meat-packing business Armour & Company, which owned the land. For a few months in 1925 the board renamed the course St. Anthony Golf Course, but reverted to the original name. That was the first of four times that Gross was elected by other commissioners to fill vacancies on the board due to resignations or, in the case of Harry Cramer’s seat in 1926, death. Gross was also elected to four six-year terms as well, but he was always elected as an incumbent. Gross had his greatest impact on park policy during his presidency of the board from 1936 to 1948. This was at a time when new recreation demands were placed on parks and when the role of parks in city life was changing. It was also a time of transition in park management as Gross’s friend, Theodore Wirth, who had been park superintendent for thirty years, was required to retire due to civil service age rules and was replaced by Christian Bossen. To complicate matters further, it was also a time of economic depression, then war, when the park board had almost no resources to meet increasing demand and had to rely on federal and state work-relief programs, such as the Works Progress Administration, for both park maintenance and recreation supervision. Throughout this period the annual reports written by Gross were thoughtful, insightful discussions of what parks could and should contribute to the life of a city, including an exploration of how the park board could work with other government agencies to address problems in society that parks and recreation alone could not. During Gross’s presidency of the board, it began to consider a more equitable distribution of park facilities, particularly playgrounds, throughout the city. The board also first began to question its policy of many years of acquiring new parks and playgrounds only if property owners in the areas agreed to pay for them through assessments on property. The policy had left gaps in the city where no parks and playgrounds existed, mostly in older and poorer neighborhoods. “In spite of our professed principles of human justice, we still do not have equal opportunities in all quarters,” Gross wrote in the 1944 annual report.” The most satisfying argument for equal recreation opportunities for all remains the simple one of human justice.” Gross wrote more in the 1944 report of the vision the park board needed as it looked to its tasks in a post-war America. In addition to providing the philosophical rationale for the park board’s work, Gross played a critical role in the rapid expansion of the park board’s airport leading up to and during World War II. He was a member of the first Metropolitan Airports Commission, created in the mid-1940s, to which the park board transferred control of the Minneapolis Municipal Airport. In 1948, at age 78, “Mr. Park Board” was defeated in his bid to be re-elected to the board. The story of the purchase of Gross Golf Course is one that tells of the Roaring 20’s, the Great Depression, World War II and the spectacular increase in the popularity of golf. The contract to acquire and develop the land for a golf course was approved by the park board March 5, 1924, but the terms of that contract, greatly revised in the park board’s favor, were not complied with until 1947. At that time the city issued $320,000 in bonds to pay off the 23-year-old contract. The story of Gross Golf Course really begins with stockyards. In 1912 the park board designated for acquisition land to widen Stinson Boulevard on the eastern border of the city. The owner of the land was Armour & Company, the Chicago-based meat-packing company. Armour owned about 800 acres of land west of the city that it had acquired as the possible site of a meat-packing plant near the New Brighton stock yards. At about that time, however, Armour had decided to build a new plant adjacent to the South St. Paul stockyards instead. The Armour plant in South St. Paul opened in 1919. Because of its decision to locate its new plant elsewhere, Armour was not only amenable to giving up some of its land for the widening of Stinson Parkway, but suggested that a parkway be built through its land west of the city limits. Armour not only donated the land for what is now part of St. Anthony Parkway, but paid for construction of the road across its property in 1913. With the popularity of the first golf courses developed by the park board at Wirth Park (then Glenwood) in 1916, followed by a course at Columbia Park in 1919, Armour approached the park board in 1923 with a proposal to develop a golf course on the property it still owned west of St Anthony Parkway. The company offered very attractive terms: they would provide the land, and pay for the development of a golf course and a small club house. Their investment, valued at $150,000 for land and another $60,000 in improvements, would be paid off by the park board over twenty years from the earnings of the golf course. Until it was paid off, the park board would pay Armour 4½ percent a year in interest on the outstanding amount it owed. The park board approved the terms of that contract in March 1924. In the park board’s 1924 annual report both board president Burton Kingsley and park superintendent Theodore Wirth assured the public that the course was acquired and improved “without any charge whatsoever” to taxpayers. The golf course opened in 1925. William D. Clark of Minneapolis helped design the course for the park board, as he had done at Wirth and Columbia, and would at Meadowbrook. 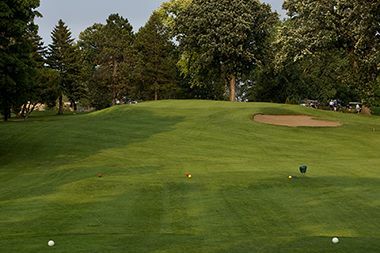 It was the first golf course in Minneapolis that had grass greens and tees. The Wirth and Columbia courses had sand greens and clay tees. 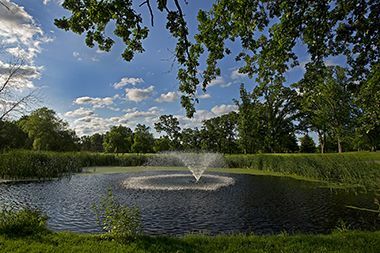 The fee for playing the new course was initially set at $1.00 for eighteen holes, more than double the forty cents charged at Wirth and Columbia. Later that summer the fee was reduced to fifty cents due to the “rough condition” of the still-young course. For the next few years fees were seventy-five cents. All went well—for awhile. For the first three years earnings at the course were less than the interest owed on the contract. Wirth reassured the public in 1927 that “there need be no apprehension that the finance plan, under which the entire indebtedness is to be paid off, cannot be consummated.” The next year a registration system was implemented at all city golf courses to eliminate long waits to get on the courses. From 1928 to 1931 earnings at the course enabled the park board to pay the accumulated annual interest and even make payments on the principal. What Wirth could not have foreseen was that annual earnings at Gross would not reach 1927 levels again until 1950 and that earnings at the course would not even cover interest payments to Armour after 1931. With the coming of the Great Depression the number of golf rounds played dropped dramatically everywhere, and continued dropping even when the park board cut fees at Armour from 75 cents to 50 cents in 1932. 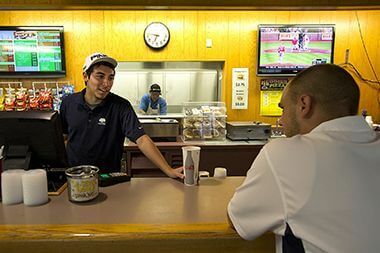 Not only did the number of rounds drop, so did spending at the club house refectory. In 1932 the park board couldn’t even pay the interest on the Armour contract from proceeds at the course. So the next year, Armour and the park board took dramatic action. 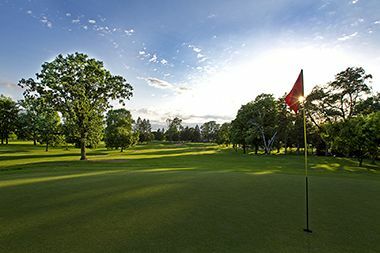 Armour made a generous offer: it would make up any deficits in operation of the course, ensuring that the park board’s meager operating revenues would not have to go toward maintaining the golf course. The company also agreed to finance a new sprinkling system for the course at a cost of about $7,000 and add it to the amount owed by the park board. The sprinkling system, the only one on any park board golf course, and greener fairways led to a one-year bump in rounds played at the course, but play then resumed its tailspin. Again in 1936 and for the next eleven years Armour agreed to make up operating deficits at the course—but interest continued to accumulate on the original debt. Meanwhile the number of golf rounds played at park board courses had dropped in half from its peak in 1928—from more than 170,000 to less than 90,000. At the time the park board operated four courses; Meadowbrook had also opened, but Hiawatha had not yet been built. In the late 1930s, the course operated at a loss and debt continued to mount. As the economy recovered in the early 1940s during Word War II, golf gained popularity even with so many citizens gone to war. There was hope that when the “boys” came home, golf would pick up. Wirth wrote in 1945 in his memoirs that it was not “unreasonable” to anticipate that the future would bring better things for the course. Even with the return to peace, however, it became evident that the park board would not be able anytime soon to make good on its 1924 contract with Armour. By 1946 rounds played at the course had jumped to a record of 31,000, but still the course earned only a little more than $3,500, nearly $12,000 short of simply paying annual interest on the contract by that time. At the end of that year the board owed more than $365,000 under the original contract and its prospects for ever paying off the debt from golf course earnings were slim. Finally in 1947, Armour must have recognized the impossibility of the situation and informed the park board that it was in default and that it had thirty days to make good on the contract. If it didn’t, title to the land would revert to Armour. Armour already had a buyer for the land, the cemetery across St. Anthony Parkway from the golf course. The park board took the news to the city council, which quickly approved the issuance of $320,000 in city bonds to buy the land from Armour. In its final act of goodwill toward the park board, Armour agreed to compute the interest it had been owed for 23 years without compounding. The bonds were issued and Armour was paid on October 25, 1947. Finally, after 23 years, the park board owned Gross Golf Course outright. 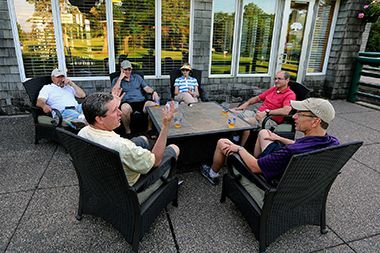 In the end the park board was right that taxpayers would not have to pay for a golf course. It just took much longer than the board thought it would in 1924. By agreement with the city council and board of estimate and taxation, the bonds issued in 1947 were retired by devoting ten cents (raised to 12 cents in 1964) from every round of golf played on all five Minneapolis golf courses to paying off the debt. The $390,000 needed to pay off the bonds and interest was finally reached in 1967. The park board may have paid a high price indirectly, however, for the acquisition of Gross Golf Course in 1947. After 17 years of no acquisitions and few improvements to the park system, the board had compiled a lengthy list of “post-war progress” projects for which it needed bond funds. A small fraction of those projects were funded over the next twenty years. While taxpayers did not pay for the golf course directly, many other desirable park projects were not funded with bonds, because of the city debt issued to buy the course. The modest original clubhouse at Gross was remodeled in 1949 and enlarged in 1963 with the addition of a basement. The 1963 improvements and the relocation of four tees and the lengthening of fairways were done in preparation for hosting the 1964 National Amateur Public Links tournament at Gross. In 1966 a couple acres of park land south of Gross Golf Course were taken by the state department of transportation for the construction of freeway I-35E. The park board was paid $291,000 for that land. The loss of that land did not have an impact on the golf course. The golf course was put to a new use in the late 1970s with the creation of cross country ski trails. The twice-remodeled clubhouse at Gross was demolished in 1985 and replaced with a new $1 million dollar facility. 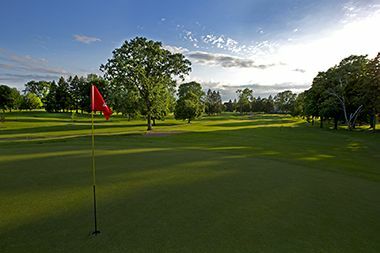 Despite lagging other city courses in rounds played for the first 60 years of its existence, in 1987 Gross set an all-time record for rounds played at any Minneapolis course at 62,000. It broke the record of 58,000 rounds played at Hiawatha in 1963. The golf rounds played at Gross, as at all other city park courses, have gradually declined since 2000, dropping from the mid-50,000s into the low-40,000s. 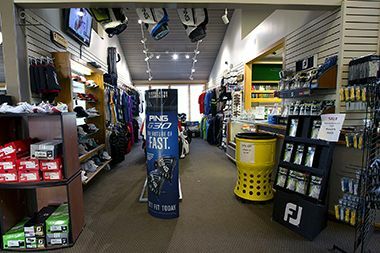 In 2004 Gross became the third city golf course to have a First Tee learning center, which provides additional practice spaces and another source of revenue from park board golf courses. In 2013 Gross added two golf simulators, which allow golfers to practice year-round on replicas of some of the world’s most famous courses.